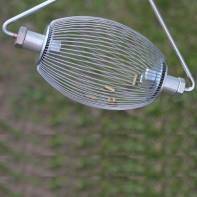 The smaller 10" Ammo Wizard is used to pick up smaller nuts, seeds, fruits, pistol brass, and balls between 3/8" and 1" in diameter. We recommend these for pin, chinquapin, black, live, post, and scarlet oaks, small acorns, or even pistol shells. The Ammo Wizard makes picking up smaller shells and nuts a breeze. The Ammo Wizard has two options: the standard blue handle or the portable retractable handle-- perfect for on-the-go.